Lord Brooker sat back and let Giselle deal with the locks. 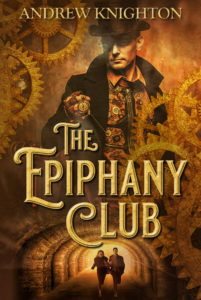 He had hired the finest tinkerer in Europe for a reason – no sense getting in her way. While he waited, he took a swig of brandy from his hip flask and looked up at the stones of the ancient library. Amazing that this place had lain hidden beneath the sands for so long. More amazing still that he would soon be inside, perusing guides to mechanica that had been lost for millennia. Something clicked, gears turned, and the stone door swung smoothly open. Giselle slid screwdrivers, spanners, and brushes back into her belt, then turned to him with a bow. Brooker lit a lantern and strode through the portal. A corridor lined with bright mosaics led him into the hillside, where ancient caves had been shaped into a series of storage rooms, just as the legends had promised. Doors swung open as he passed, driven by panels in the floor beneath his feet and elaborate systems of pulleys and counterweights. Oh yes. It had been worth spending the family fortune to find this. He walked into one of the rooms. Shelf after shelf stretched out before him. But instead of books and scrolls he saw more devices, gleaming collections of gears and springs held together with brass frames. He strode into the next room and the next. No books. No parchments. Not even any tablets. Just ancient, dusty machines. Giselle lowered one of the devices from its shelf. A smile parted her lips as she examined it. “Fine.” Brooker gave a dismissive wave. As she started pulling out her tools, he took another swig from his hip flask. This whole business was turning into a disaster. Years of study and pursuit. Learning a dozen ancient middle eastern languages. Paying off a government to give him exclusive rights to this site, so that he could have the books he found. And instead, old machines, probably all useless and outdated. He would have to start again, and that meant raising fresh funds. Perhaps he could sell off these devices, whatever they were. There was always a market for ancient collectables. It was little recompense for having his dreams trampled, but at least it was something. His mind returned to the so-called library. He looked around, saw heaps of devices and parts piled up around Giselle, and gaped in horror. She held up one of the devices. Attached to the side was a new, improvised machine, a set of prongs connected to a small copper funnel. As she let go of a spring, the device rattled into motion. A voice emerged from the funnel, rasping and unclear. “Let me see.” Brooker snatched the machine and held it close to his ear. He could make out distinct words, but what language were they in? Greek? Hebrew? Sumerian? He let out a long, deflated breath. “Should I stop working on these?” Giselle gestured at another dozen devices, all with funnels attached. 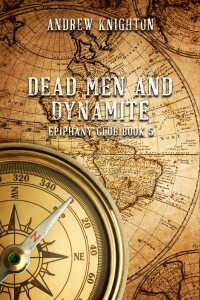 The fifth and final instalment in my Epiphany Club series of steampunk novellas, Dead Men and Dynamite, is out today!. It also features strange devices, an ancient library, and lost lore. So if you enjoyed this, please check it out, or go get the first novella for free.